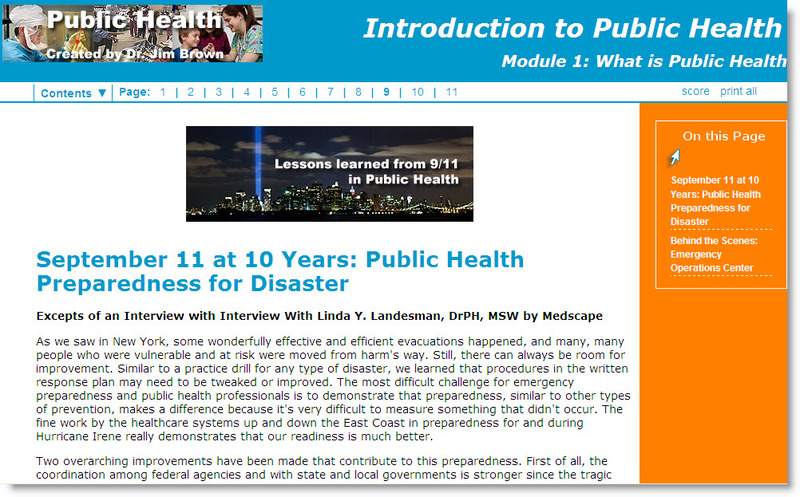 At the request of the New Jersey Public Health Training Center, Dr. Jim Brown designed an online “Introduction to Public Health” course for New Jersey community college students. The interactive course covered public health topics from disease prevention to epidemiology, addressing a key goal of the course’s main sponsor, the (NJPHTC): to introduce and expose more students to the field of public health. However, Dr.Brown couldn’t quite meet that goal without reaching more of New Jersey’s community college students. Statewide adoption was slow, though the course was well-received at Kean University where Dr. Brown teaches as an adjunct. How could he easily reach 19 community colleges, with varying LMS, programs and student bodies? 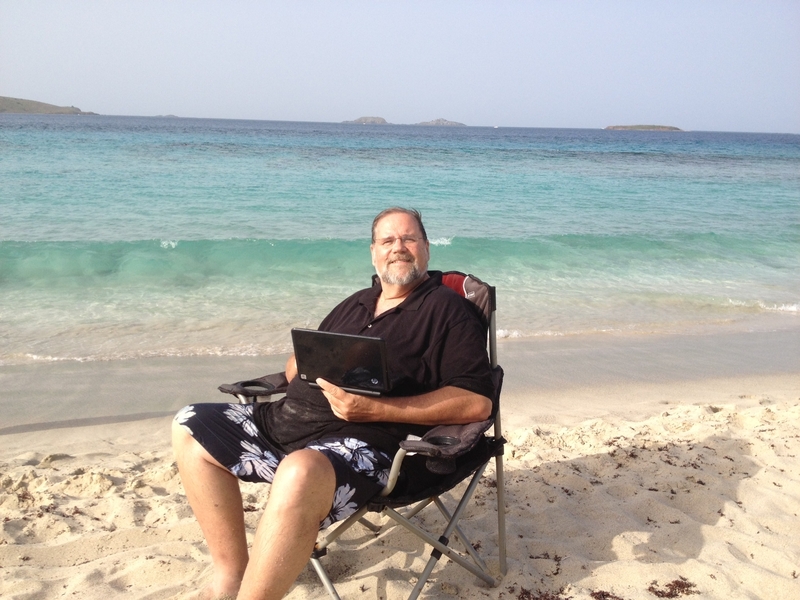 Dr. Brown is one of the first instructors to deliver a course with the help of SoftChalk Cloud. 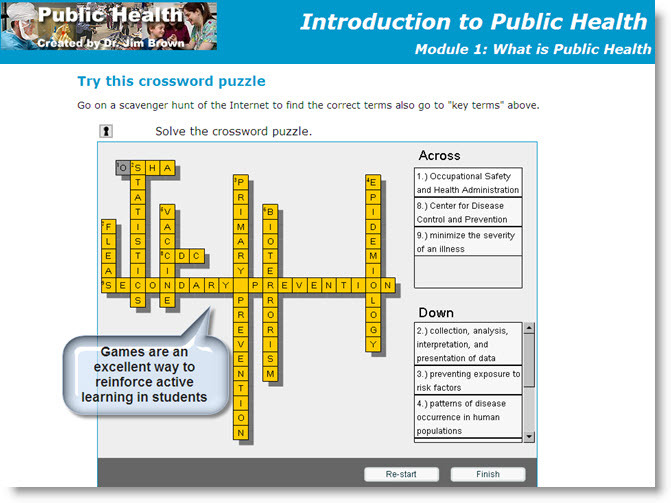 Beginning in summer 2012, he offered “Introduction to Public Health” through Burlington County College using SoftChalk Cloud. With the help of this solution, NJPHTC anticipates that as many as 10 out of the 19 community colleges will offer the course, beginning a pipeline of students into the State’s upper division baccalaureate public health programs. Dr. Brown finds it quick and easy to create highly interactive and engaging courses with SoftChalk. He creates learning games, customizable flashcards and crossword puzzles, as well as a variety of quizzes, video public service announcements from the Centers for Disease Control and Prevention, and more. SoftChalk Cloud streamlines both assessment tracking and updating content among multiple LMS. At the time of writing, three other New Jersey community colleges are looking into adopting the “Introduction to Public Health” course as part of a pilot project. With the help of SoftChalk Cloud, the course can reach increasing numbers of students with content that can easily change with the fast-moving field of public health. And Dr. Brown will be able to make those changes seamlessly and quickly, whether he’s in his office at Ocean County College or on the beach.